The R.L. Drake Company produced the R-4C as the final refinement of their previous popular R4, R4A and R4B models. 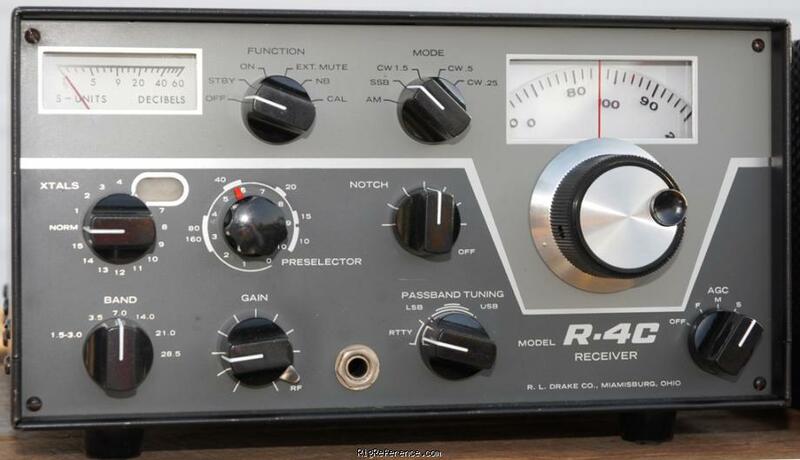 The R4C covers: 3.5-4, 7-7.5, 14-14.5, 21-21.5 and 28.5-29 MHz plus fifteen additional 500 kHz crystal positions (with optional crystals). Modes of reception include: SSB, CW, AM and RTTY. The dial accuracy is and impressive ±1 kHz. Features include: PBT, Line out, Crystal Calibrator (25 kHz), RF Gain, Mute Jack, Speaker Jack, Anti-Vox Jack, Dial Lamp and Spinner Knob. This radio requires an external speaker. Estimating the value of a rig can be challenging. We collect prices paid by real hams over the years to help you estimate the current value of the Drake R4C. Just bought or sold this model? Let us know what you traded it for and help other ham operators!